1 May. Some sixty volunteers assemble at Brevard's Station [Stanley] or in Dallas in Gaston County and organize a military company. B. F. Briggs is voted captain, Leroy W. Stowe, first lieutenant, and Isaac D. Holland, second lieutenant. This company will become Co. M, 6th North Carolina Volunteer Regiment. Eventually they become part of the 16th North Carolina. 8 May. The North Carolina legislature passes "An Act to raise 10,000 troops." 11 May. Private James Hudson, a farmhand from Charlotte and a member of the Hornet's Nest Rifles (Company B, 1st NC Volunteers), dies of pneumonia -- the first of some 40,000 North Carolinians to die in the war. Disease will kill many more than combat. 13 May. The 1st North Carolina Regiment is formally created with companies from 10 counties. Led by Daniel Harvey Hill, they leave for Virginia where they will become known as the "Bethel Regiment". 13 May. Union General George B. McClellan becomes commander of the Department of the Ohio. 14 May. With a war between the North and the South in the offing, everyone has to make decisions. The Moravian Provincial Conference at Salem, North Carolina discusses whether they should bring local children who are attending school in Pennsylvania back home. "We resolved first to talk again with their parents, to learn their wishes definitely." 20 May. The Secession Convention meets in Raleigh. (On this date in 1775 the Mecklenburg Declaration of Independence had been signed.) Sidney X. Johnston is the delegate from Gaston County. William Lander, representative from Lincoln County, will serve only until June 28th when he resigns. North Carolina votes to secede. The convention also adopts a flag: "Be it ordained by this Convention, and it is hereby ordained by the authority of the same, That the Flag of North Carolina shall consist of a red field with a white star in the center, and with the inscription, above the star, in a semi-circular form, of "May 20th, 1775," and below the star, in a semi-circular form, of "May 20th, 1861." That there shall be two bars of equal width, and the length of the field shall be equal to the bar, the width of the field being equal to both bars: the first bar shall be blue, and second shall be white: and the length of the flag shall be one-third more than its width." At Raleigh state militia major Stephen Dodson Ramseur of Lincolnton gives the order to fire first a 100-gun salute in honor of the state's secession and then another to mark its becoming a member of the Confederacy. 20 May. Kentucky tries to stay neutral, issuing a proclamation on this day asking both sides to leave the state alone. Eventually there will be 2 governments as a Confederate group forms a "rump" government. 21 May. Richmond, Virginia becomes the capital of the Confederate States. 23 May. A company forms in Lincoln County and christens itself the "Hog Hill Guards". More prosaically they will become Company B, 23rd North Carolina. 24 May. Union forces move into the Confederate States. New York Zouaves led by Elmer Ellsworth go by steamboat to Alexandria. The landing is peaceful until Ellsworth spies a large Confederate flag flying from a hotel. Ellsworth himself cuts down the flag from the roof, but as he returns downstairs, the hotel's owner fires a shotgun straight into his chest. He is the first Union officer killed in the war. A private immediately kills the landlord. 30 May. At Norfolk, Virginia Confederates raise the USS Merrimac which had been scuttled and burned when the Federal forces left. She will be rebuilt as the CSS Virginia. Freedom, by William Safire, pub. 1987, 1125 p., call #: FIC SAF. The 20 months between Lincoln's suspension of habeas corpus and his signing of the Emancipation Proclamation were perhaps the most crucial period in American history, a time when a lasting definition of American democracy was being forged by civil war. This enormous book is both an outstanding history of that critical time and a model historical novel. Over a hundred pages of notes testify to Safire's thorough research and present the carefully reasoned speculation justifying his imagining certain scenes. As a Civil War historian he is worthy of mention beside Bruce Catton or Shelby Foote. As a Civil War novelist, as the creator of a vividly compelling book, Safire is easily the equal of MacKinley Kantor, John Jakes, or Gore Vidal, and perhaps their superior. An impressive achievement, one of the very few truly significant Civil War novels. Sue Mundy opens in 1861, when fifteen-year-old Jerome Clark, called "Jarom," leaves everyone he loves to follow his older cousin into the Confederate infantry. There, confronted by the hardships of what he slowly understands is a losing fight, Jarom's romanticized notions of adventure and heroism are crushed under the burdens of hunger, sleepless nights, and mindless atrocities. Captured by Union forces and imprisoned in Camp Morton, Jarom makes a daring escape, crossing the Ohio River under cover of darkness and finding refuge and refreshed patriotic zeal first in Adam R. Johnson's Tenth Kentucky Calvary, then among General John Hunt Morgan's infamous brigade. Morgan's shocking death in 1864 proves a bad omen for the Confederate cause, as members of his group of raiders scatter -- some to rejoin organized forces, others, like Jarom, to opt for another, less civilized sort of warfare. Displaced and desperate for revenge, Jarom and his band of Confederate deserters wreak havoc in Kentucky: a rampage of senseless murder and thievery in an uncertain quest to inflict punishment on Union sympathizers. Long-locked and clean-shaven, Jarom is mistakenly labeled female by the media -- but Sue Mundy is about more than the transformation of a man into a woman, and then a legend. Ironically, Sue Mundy becomes the persona by which Jarom's darkest self is revealed, and perhaps redeemed. Eben Tyne, Powdermonkey, by Patricia Beatty and Phillip Robbins, 1990, 227 p., call #: J BEA. A thirteen-year-old powdermonkey in the Confederate navy joins the crew of the ironclad Merrimack in a mission to break the Union blockade of Norfolk harbor. What were Zouaves? See chapter 6 for an explanation. 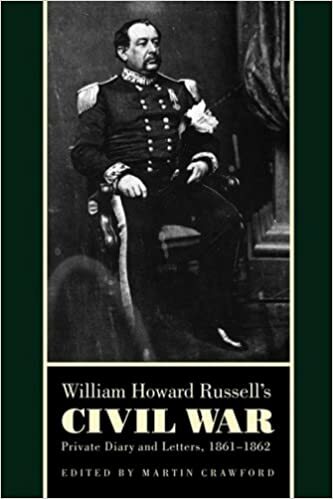 This is one of a set of volumes based on the History Channel production, "Civil War Journal." Russell, a correspondent for the Times of London, was sent to the United States to explain the Civil War to its readers . He toured North and South, interviewing their respective leaders, and wrote a series of articles critical of both sides (but especially of the military direction of the Union armies) that so alienated everyone that he was forced to return to England. My Diary North and South, a reconstruction of his journeys based on his diary and published dispatches, remains a classic of the Civil War period. This new work publishes Russell's actual diary, supplemented by his letters from the same period, to present a day-by-day account of his trip. "North Carolina sent more than 125,000 men and boys to fight the Civil War. About 40,000 died on the battlefield or by disease. This compilation of obituaries from newspapers documents the date and cause of death for hundreds of soldiers, with many providing place of burial, surviving relatives, last words, accounts by comrades and details of military service." -- Provided by publisher. This well-written resource contains biographies of key people, information on major battles, and a general introduction to the era. The alphabetically arranged entries are easy to understand, covering all the important issues, and the black-and-white photos and reproductions add immensely to the text. Even readers familiar with the era will find fresh facts here. The personal profiles use small anecdotes to illustrate the individual's character. For example, the entry on George Pickett talks about the depression that plagued him for the rest of his life after the Battle of Gettysburg. This is a wonderful introduction for readers unfamiliar with the subject, and will be especially useful for reports.